When it comes to solar power in Australia, lots of things have changed in the last few years. If you’re currently shopping around for a solar system, perhaps the most important thing you need to keep in mind is this: You’ll get the most out of your solar panels by consuming the energy they produce while it is being produced. This is usually referred to as ‘solar self-consumption’, and it is the key to ensuring that your solar system delivers to you the best return possible. Once upon a time in Australia there were state-based incentives for solar power generation called solar feed-in tariffs. These incentives rewarded solar homes for sending their solar energy into the grid at generous rates – frequently over 30 cents per unit of energy (kilowatt-hour, kWh). In contrast, these households may have only been paying 20c/kWh for electricity they purchased from the their electricity retailers. In these circumstances, it made sense to send solar into the grid, as this would deliver the biggest savings. These days, pretty much anywhere you are in Australia the rate you will be paid for excess solar energy is generally very low (unless you are on a legacy feed-in tariff), regardless of whether there is a regulated minimum rate in your state or if the rate is a voluntary one set by your retailer. This means that if you’ve only just come into the solar game, you might be looking at your neighbour’s solar system wondering why they get 44c/kWh (to use a Queensland example), while the highest rates you can find are 4-10c/kWh. It’s important to note that back then bigger bill savings were necessary for solar to make economic sense – solar systems were about 4x to 5x more expensive in 2010 than what they are now. So while we might look back with envy on ‘the good ol’ days’ when incentives were higher, the fact is that these days the solar value proposition is much closer to standing on its own proverbial legs, and as such the incentives are not needed to the same degree (although we certainly wouldn’t be complaining if they were still available). It does mean, however, that there are certain considerations you should make when choosing a system. Even without feed-in tariffs, Australian homes are still installing solar in droves, with roughly 10,000 new residential solar systems being installed per month across the country. Solar system installation prices are lower than they’ve ever been, so as long as you’ve got an unshaded roof and some daytime electricity usage at your home, solar will probably work for you. Any energy that your system produces will go first into your home to power any devices that happen to be running – thus reducing the amount of energy you have to purchase (‘import’) from the your electricity retailer. 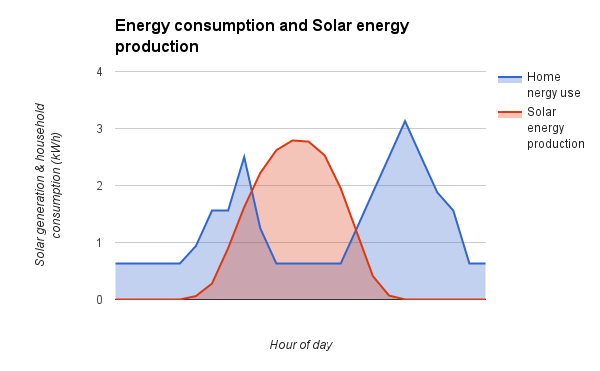 If your solar system produces more energy than your household can consume at a given moment (e.g. 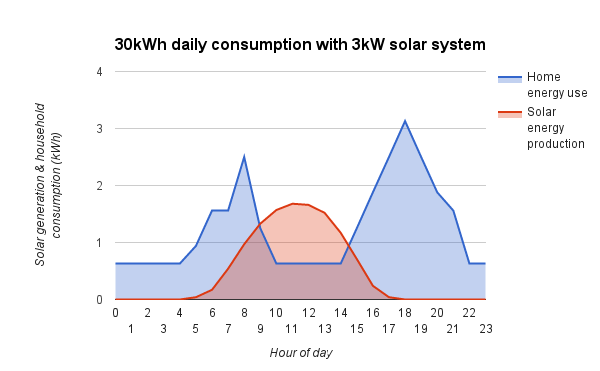 if you’re not home), the excess solar is automatically sent back into the grid. This ‘exported’ solar energy is what earns you the low feed-in rates mentioned above. Your goal, therefore, is to try to keep as much solar as possible in your home, powering your devices. There are two dovetailed approaches that you can take to achieve this goal: a) get a system that is well-sized for your home, and b) try to make sure you run devices when the sun is shining. Interestingly, difference between payback periods on the systems is not particularly large (at least at the example prices we’ve plugged in here). Looking only at these ‘natural’ self-consumption rates (i.e. the amount of solar that would go to direct use in the home without any special technology, effort or behavioural change), payback periods for both systems are about 5 years. In either case, this is pretty good. With all of the above in mind, choose your system – and your system size – carefully. 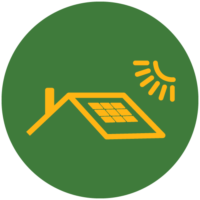 Solar Choice can help you instantly compare solar & storage system installation prices – for free. Simply enter your details into the Quote Comparison Request form to the right of this page. Want to investigate solar system payback & ROI? Check out our Solar PV System Payback & ROI Estimator. Not sure what solar system size is right for you? Check out our Solar System Sizing Estimator Tool. Want to investigate sizing for solar and batteries? Check out our Solar & Battery Storage System Sizing Estimator. Check out a comprehensive list of approaches to increasing self-consumption in this article (which focuses on NSW but is applicable to pretty much anywhere in Australia). Our calculators are our IP and have to remain the black boxes that they are to prevent them from being used by people who haven’t put in the effort that we have in making them. Happy to try to explain them a bit more if you like – shoot me an email on james@solarchoice.net.au. Next post: Solar-plus-storage: How much battery capacity do you need?